1. Proof the yeast for the dough in warm water in the mixer bowl for 5 min, or until foamy and bubbly. 2. Warm the milk to 100F in a saucepan. Add warmed milk, buttermilk, 3Tbsp sugar, 2 Tbsp butter, 3 1/2 cups flour and salt to the proofed yeast. With a paddle attachment mix on low speed until combined, then increase speed to high beat for 2 more min. Switch to the dough hook and add the remaining 1 1/2cups flour. Mix on low speed until incorporated, then increase speed to medium. Mix for 5-7 min or until dough pulls away for from the sides. Cover the bowl with plastic. Put the oven on 350F and put the bowl with the dough on top of the stove, the heat underneath the bowl from the oven will make the dough rise. If you make it from the frozen dough, defrost the dough, Butter the cast iron skillets. 3. Make little balls out of the dough and let it rise in a cast iron skillet. Melt some butter and brush the top of the rolls with it. Put the rolls in a preheated oven of 350F/180C for 30 min. Brush with some melted butter and maybe you like to add some thyme, sea salt, poppy seeds or sesame seeds. Proof the yeast for the dough in warm water in the mixer bowl for 5 min, or until foamy and bubbly. Warm the milk to 100F in a saucepan. Add warmed milk, buttermilk, 3Tbsp sugar, 2 Tbsp butter, 3½ cups flour and salt to the proofed yeast. With a paddle attachment mix on low speed until combined, then increase speed to high beat for 2 more min. Switch to the dough hook and add the remaining 1½cups flour. Mix on low speed until incorporated, then increase speed to medium. Mix for 5-7 min or until dough pulls away for from the sides. Cover the bowl with plastic. Put the oven on 350F and put the bowl with the dough on top of the stove, the heat underneath the bowl from the oven will make the dough rise. If you make it from the frozen dough, defrost the dough, Butter the cast iron skillets. Make little balls out of the dough and let it rise in a cast iron skillet. 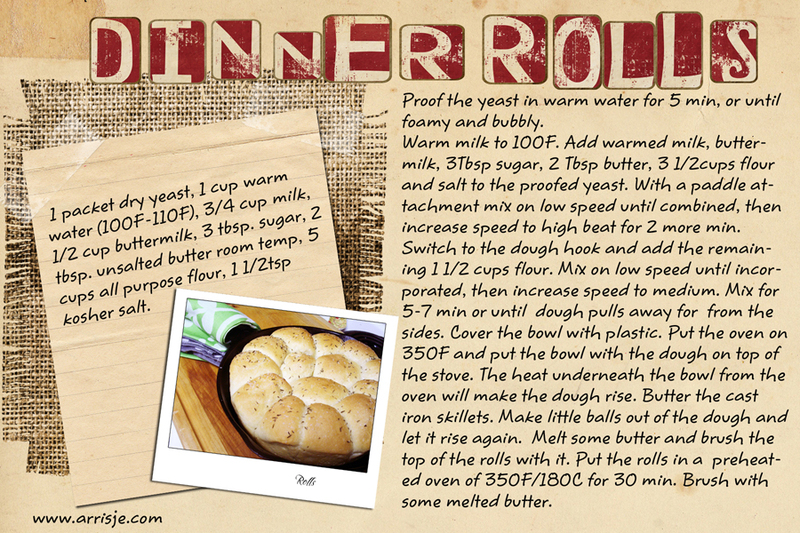 Melt some butter and brush the top of the rolls with it. Put the rolls in a preheated oven of 350F/180C for 30 min. 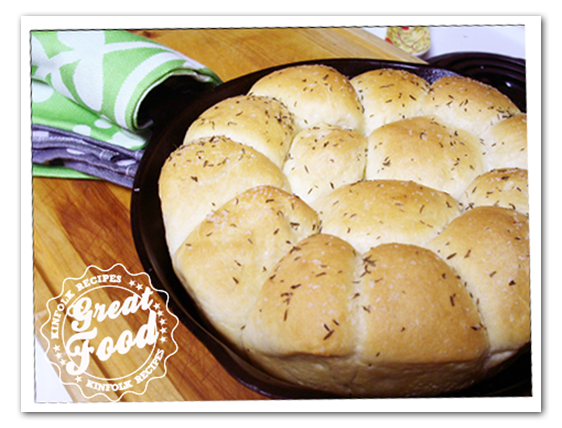 Brush with some melted butter and maybe you like to add some thyme, sea salt, poppy seeds or sesame seeds.